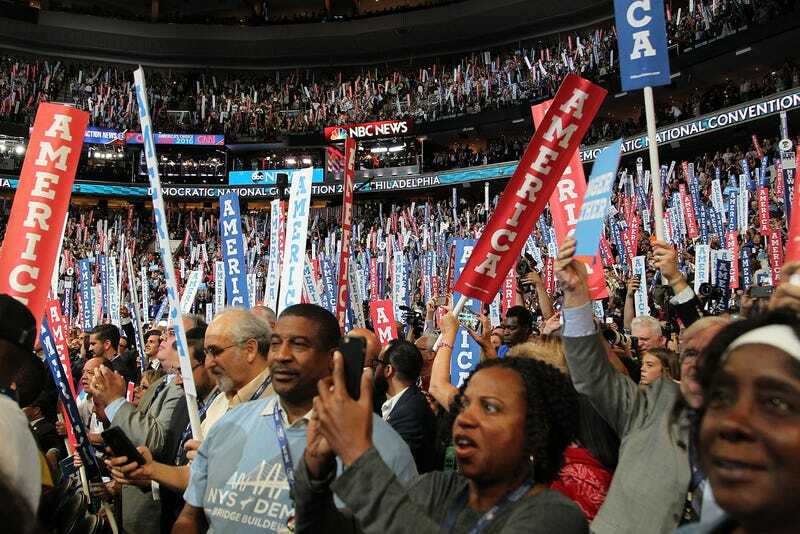 Delegates wave banners on the second day of the 2016 Democratic National Convention at the Wells Fargo Center in Philadelphia on July 26, 2016. No convention of a major political party in the city of Philadelphia can take place without great degrees of deference to its blackness. Pundits unable or unwilling to do so will quickly melt into nonsensical half-assedness, the consequence of white-typecasting Philly with the lore of cheesesteaks, perennially angry Eagles fans and “Brotherly Love.” But in this vast, creaking city of 1.5 million, where more than 40 percent of the population is African American, its black experience is quintessential to its existence. Democratic National Convention delegates are wrangling over a messy nomination process, which now includes Russian-hacked emails and the spurned sensibilities of typically white “Bernie or Bust” supporters. But the real urgency in this weeklong moment is found in Philadelphia's lingering problems of incessant poverty, broken schools and unchanged crumbling neighborhoods, resigned to eventual waves of merciless gentrification. Barbara Grant, a Philadelphia media strategist and journalist on WURD-AM (Pennsylvania’s only black-owned talk radio station), hopes so, too. “There is real fear that we could end up with a President Donald Trump and that we could contribute to that outcome if we don't turn out a big vote. “People are realizing that sitting it out is not an option if we care about the future of our people,” she adds. Black Philly grapples with what is, very likely, the most consequential presidential election since 1968. The result is stone-faced grit, bracing for or preparing for the worst, since luck has always been (persistently) in very short supply for black Philadelphians. But it is betrayed (both in the stifling convention-week humidity and the cruelty of circumstance) by sightings of beady perspiration. When one is walking through the rusty, chipped-paint, pissy corridors of subway stations, or crossing streets of buckling sidewalks and ancient flat-top row houses barely standing, reflections on politics are interrupted by persistent hustle. “I need a paycheck! I need food on the table!” a random brother chants back jokingly at a growing line of hot and bothered protesters outside the Wells Fargo Center subway stop. After a long, backbreaking day of labor, the black man draws little comfort from the anger outside. “It’s a struggle out here; they just don’t get it,” he says as he rushes onto the SEPTA Broad Street Line. “Take a walk in my shoes; I got kids to feed. “I don’t need Bernie. I need overtime,” he adds. Black Philly is jaded. It’s seen this episode before. It’s known white politicians who overpromise and don’t deliver, and it’s intimately familiar with white populist tyrants who bully their way into power. Much of it stems from pessimism, and being an outspoken curmudgeon is already built into the city’s DNA. Forgotten in the drama of the DNC is the fact that this year is the 200th birthday of the African Methodist Episcopal Church, when black Philly congregants under Richard Allen walked out of racist white churches to form the first organized black church. Philly’s folks of color understand that they are in a unique and difficult position, living in a battleground state that could determine a national election—but “they are not going to the polls enthusiastically,” observes Keaton Nichols, a WURD-AM host and executive producer. Overall, however, there is black-Philly recognition that stakes are immeasurably high, given not only the “What comes next?” aspect of President Barack Obama’s imminent departure but also the very real threat of insanity crystallized into President Donald Trump. “You grew up here, so you remember Rizzo, right?” says one raspy-voiced black Philly boomer in line at a local Wawa, reflecting on the municipal-dictatorship days of head-cracking Philadelphia Mayor Frank Rizzo. Still, many maintain an optimism—albeit cautious optimism—about this election. “I’ve been hearing enthusiastic support for Hillary Clinton and the Democratic convention coming to Philadelphia,” Councilman Kenyatta Johnson (D-2nd District) tells The Root. “However, we want to make sure that once Clinton becomes president, she has an urban agenda, an agenda that focuses on bringing resources to our cities and our neighborhoods” for issues such as youth gun violence, affordable housing and education. “When I’m in the barbershop, these are some of the key conversations taking place,” she says.